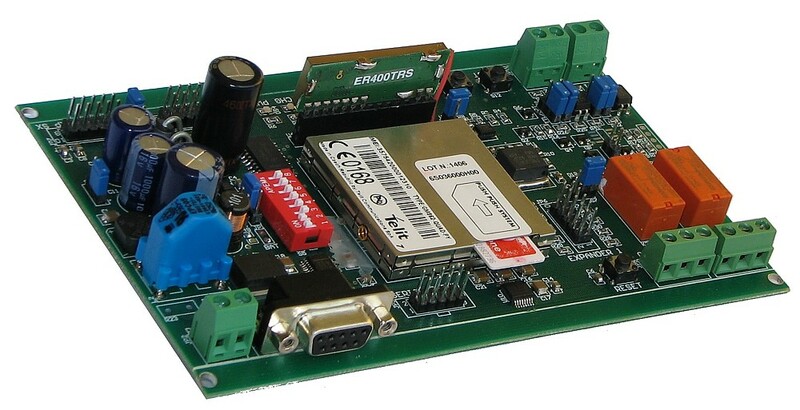 SX-PY board is surely the easiest and most powerful GSM/GPRS remote control system that you can imagine: it is based on TELIT GM862-PY modem with Python interpreter on board and It encloses in a 9 DIN rail modules case: 2 optocoupled inputs, 2 relays outputs, an RS232 serial port, a debug serial port, 2 expander connectors, backup battery with power fail detection and more� The module is programmable with simple Python scripts to be uploaded through the serial port, and it allows also users with no specific experience to easily realize remote control systems via GSM/SMS/GPRS. And it�s not enough: this board allows to change the GM862-PY module with the GM862-GPS one that, besides the described previous features, supports also a GPS receiver for localization applications. Telit GM862-PY modems (you may find an application based on Telit modem in this article: How to execute a Phyton script with Telit ) are very powerful: they, not only work very well as quad band modem, but also support a Python interpreter with 3MB Flash Memory and 1.5MB RAM, 2 serial ports and 13 input/output serial lines: just one problem is using the modem without a specific hardware capable to support power supply and peripherals lines on the very small Molex connector. SX-PY is the solution to these problems, a board developed with power and simplicity in mind: in fact all the features of GM862 module are available, ready to be used in our projects. The modem, as mentioned, may be programmed with Python script, a wide spread language and vary easy to use: many dedicated web sites are available with all the needed information, e.g. www.python.it or www.python.org. Python interpreter onboard already supports all the library for hardware control (e.g. to send commands to the modem and to receive responses), so allowing a fast use of all the features without any need of rewriting low level functions. Programming the GM862 modem on board of SX-PY is executed through serial port, using AT commands: to make this operation easier, Area SX provides also a free software with a simple graphical interface (SxPyDownloadTool :Python script management for Telit modem engines). All the peripherals and interfaces on board are well designed, in particular some of them deserve a more accurate view. Power supply section supports a wide range voltage both DC and AC and a strong filter. This allows a very good noise rejection that may pass on power line because of electromagnetic interference. This section is completed by a connector for backup battery with related recharge circuit; battery charge level and power supply status are directly monitored by modem AT commands and so available in our scripts. When power supply fails, backup battery automatically works; power is ensured to modem and, optionally, to expander bus while the remaining hardware is turned off: in this condition the device may work for 36 hours and more. The two inputs on board may be configured one different from the other. In particular it is possible to use completely optocoupled inputs supporting also no-polarized voltage or voltage-free inputs. Relays outputs can drive loads with voltage up to 48V and peak current of 2A. On the standard 9 pin female connector you find a complete serial port, straight connected to the modem. Using this serial port, you can control the modem from external application and upload Python scripts. Above all the features, one very important to easily use a programmable system is surely the chance to have a debug interface for your source code. SX-PY board supports this feature with debug serial port that allows to control script running during a test phase. This serial port is placed on a 5x2 pins connector to be used with a flat cable with a crimped serial connector. 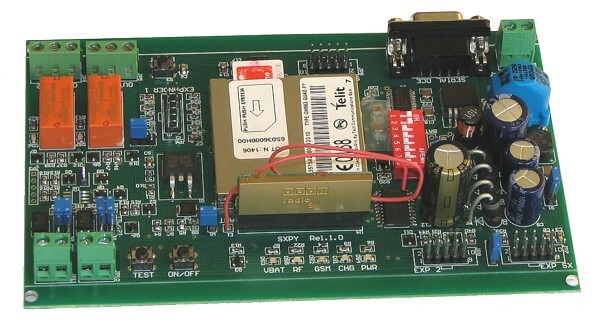 Board equipment is completed by a RF (433MHz) wireless serial slot and two expander connectors: the first allows a straight link to FLEX interface boards, such as SX16B, as mentioned before (SX16B - IN/OUT expansion board) or FLEX Analog (FLEX-Analog: an analog acquisition board with flexibility in mind!). 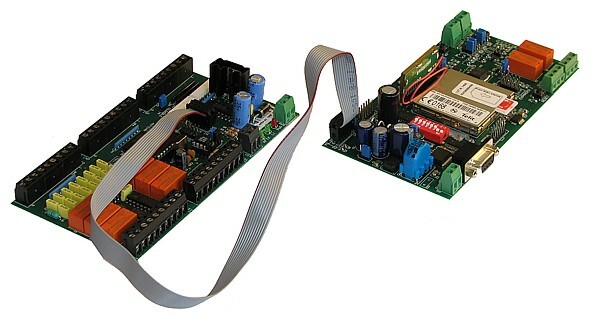 The second allows the proprietary hardware connection, supporting 8 input/output lines and power supply line; this one may be both +5V or +3.7V with backup power supply from a battery to ensure reliability. SX-PY board has a connector for straight link to SX16B board (SX16B - IN/OUT expansion board): this way 24 inputs, 6 relay outputs and a temperature sensor ara available for Python scripts control. Moreover, since SX16B is very flexible and scalable, you can connect several boars in a cascade configuration to realize a further input/output expansion. You can use the same connector to link FLEX Analog board (FLEX-Analog: an analog acquisition board with flexibility in mind!) to support 8 A/D inputs and 2 D/A outputs with 8 bit resolution. SX-PY board, as the SX16B one, may be placed in a 9 modules DIN rail case. This makes the board very suitable to be used in electric panels to realize remote control systems, surveillance and automation in houses or industrial environments. All prices are indicated in Euros without shipping costs and VAT (where applicable). The prices are for single unit. The SXPY development kit is the perfect solution to start with the Python enabled Telit Modems. The kit includes all the hardware and software tools needed to build your own GSM remote control system. The SXPY development kit is the perfect solution to start with the Python enabled Telit Modems with integrated GPS receiver.